This entry was posted in General News, Students and tagged College of Liberal Arts, Issac Scott Hathaway on February 14, 2013 by Wire Eagle. AUBURN UNIVERSITY – Eight Auburn University students led by Mark Wilson, director of Civic Learning Initiatives in the College of Liberal Arts, began an educational project last fall with the Tuskegee Human and Civil Rights Multicultural Center to unveil the life and work of African-American artist Isaac Scott Hathaway. Most widely known for his ceramic sculptures of prominent African-Americans such as George Washington Carver, Frederick Douglass, Booker T. Washington, W.E.B. Debois, Jessie Owens and Jackie Robinson, Hathaway made significant contributions to educational art through his teaching career. After more than 30 years of teaching art and working as a sculptor, Hathaway brought his talents to east Alabama in 1937 when he and his wife moved to Tuskegee to establish the Ceramics Department at Tuskegee Institute. 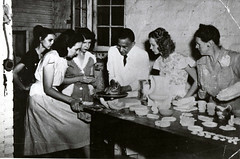 In 1947, Hathaway broke a significant racial barrier when he introduced ceramics at the all-white Alabama Polytechnic Institute. “We went to the Tuskegee University Archives and confirmed what we had heard, but did not know it was documented as well as it is, that Hathaway taught at Auburn, which was then Alabama Polytechnic Institute, in the summer of 1947,” Wilson said. “It was fun because Audrey Ross, a student, and I were at the archives and found a letter of reference for Hathaway from Dean Marion Spidle of API, talking about his teaching and introducing ceramics in a workshop that summer, which was 16 years before the integration of Auburn. The students developed hands-on educational activity kits for use in schools and the community. Led by Auburn students, schoolchildren made masks and painted sculptures to experience the types of work Hathaway did as an artist. The painted sculptures were given as prizes to residents at the Tuskegee Senior Center who participated in an Isaac Hathaway bingo game developed by one of the Auburn students. Students also worked with the multicultural center to develop a website, http://isaacscotthathaway.wordpress.com/, dedicated to the life and work of Hathaway. The website showcases biographical information, a student-produced video, a compilation of photos, a podcast written, produced and performed by Auburn students and a digital copy of a pamphlet. Since launching the website in early December, scholars and media outlets have expressed interest in promoting and contributing to the students’ project. In fact, the Voyager Media Group in Lexington, Ky., plans to tweak a working script for a national documentary on Hathaway to include his work at Alabama Polytechnic Institute. In addition, educators from the state of Alabama and beyond have contacted Wilson for information on ways to use the student-created educational kits in their own classrooms. The class project was part of the college’s participation in the Appalachian Teaching Project of the Appalachian Regional Commission, which brings students, faculty and community members together for collaboration on issues affecting the Appalachian region. Accompanied by Wilson, the students traveled to Washington, D.C., to present their work at the commission conference in December. Auburn University was one of only 15 institutions invited to the conference and is the only consortium member representing the state of Alabama. The full story including photos and videos is available on the Auburn University website at http://ocm.auburn.edu/featured_story/hathaway.html.